Create a new profitable business servicing the Swedish real estate market. Two first time entrepreneurs started selling billing systems to real estate agents in Sweden, but were dissatisfied with their modest success. Realising a rising demand among agents in Sweden for new technologies to differentiate themselves and win business, the pair decided to change their strategy. They came across Matterport in 2015 and recognized its game-changing technology would allow them to begin offering 3D immersive experiences to their clients. Objekt 360 was born and they haven’t looked back since. 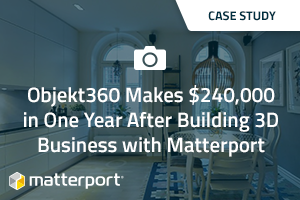 Immediately after purchasing their first cameras and joining the Matterport Service Partner Program, Objekt360 scanned a few properties for a local franchise realtor in Stockholm. Following this pilot, they were called by the second largest realtor franchise in Sweden and were contracted to conduct 223 sales meetings all over the country to promote the Matterport technology. As a result of these meetings, agents were clamouring to purchase Matterport’s cutting-edge technology as a way to feature their listings and differentiate themselves from the competition. Their next challenge was to determine how to price and package Matterport 3D Tours for agents. After developing a strategic partnership with the largest photography network in Sweden, Objekt360 began packaging photography with 3D tours and pricing more competitively. The package includes 3D + photos + floorplans with the 3D representing around $120 (instead of $270 without packaging) of the total cost. To date, Objekt360 has completed over 3,000 Matterport models and grown their business to 24 cameras. After dropping their price point, Objekt360 increased utilization from 5 uploads per month of over 100 per month. With the help of Matterport, Objekt360’s agents have been able to generate over 12 million impressions and over 750k unique visitors. Objekt360 is the largest supplier of 3D tours in the Nordic region. They introduced the 3D tour on the Swedish market in 2015 and we have seen amazing growth in demand for the service ever since. Today they have customers, cameras and educated 3D photographers all over the country!